Drunk driving and binge drinking among the American veteran population has spiked considerably in recent years, a recent study by the American Addiction Centers found. Observing behavioral risk factor data from the Centers for Disease Control and Prevention (CDC), the AAC took a closer look at the rising occurrence “of binge drinking among veterans, drunk driving incidents, and the emotional and physical trauma that could be leading to this substance misuse among” the military population, the authors wrote. Veteran rates of binge drinking, defined as “consuming more than four drinks within a two-hour period for women and five drinks for men,” have climbed from about 14 percent in 2013 to just under 16 percent in 2017, a trend that contributes significantly to both mental and physical health issues. Dissecting that data further revealed trends in sub-sections of the veteran population. 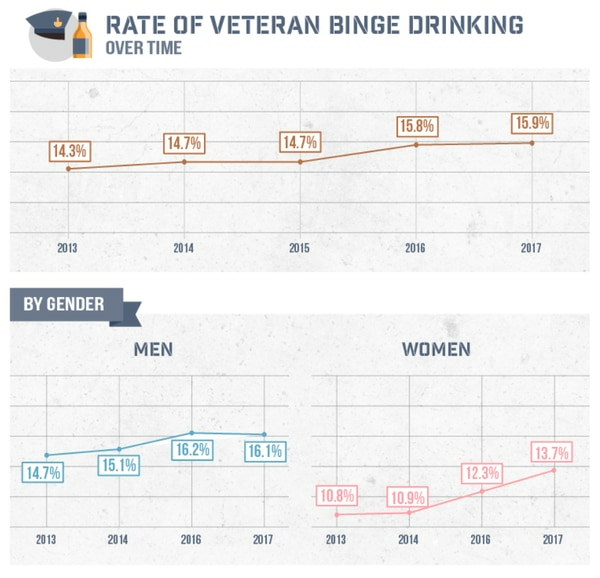 For example, while the overall increase of veteran binge drinking during the 2013 to 2017 research period came to 1.6 percent, binge drinking among female veterans increased nearly 3 percent, double the increase experienced by male veterans. One fallout of the increasing number of binge-drinking service members has been the prevalence of drunk driving, a widespread issue in the U.S. that accounted for nearly 30 deaths per day in 2016. With this demographic’s propensity for drinking to excess, “there’s no denying that American veterans contribute to the nationwide epidemic of drunk driving,” the study claims. 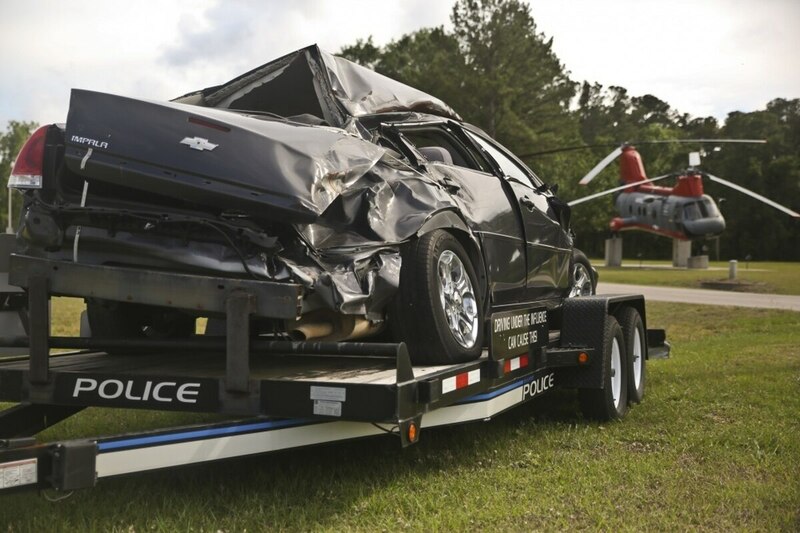 “Since 2014, the percentage of U.S. vets identified as driving while drunk increased from 1.6 percent to 2.5 percent,” a nearly-60 percent spike. Broken down by location, veteran drunk driving occurred most often in California, Kentucky and Washington, D.C., while Virginia, Alaska and Utah were states with the lowest occurrence rate. 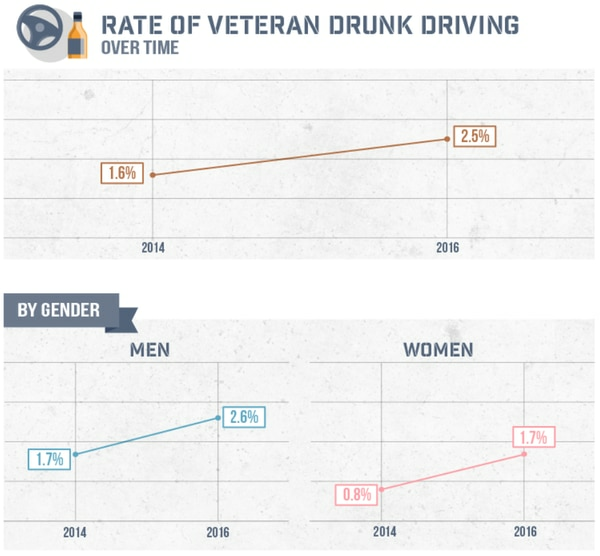 Furthermore, rates of drunk driving were significantly higher among male veterans than women. Despite the surge of veterans driving while intoxicated, “some officials are trying to pass legislation that would allow veterans to avoid conviction in charges associated with driving under the influence,” the report said. The psychological wellbeing of troops returning from wars in Iraq and Afghanistan is increasingly a focus of mental health studies that center on post-traumatic stress disorder. Nearly three million service members have deployed in support of American war operations since 2001. For those returning from war in Iraq or Afghanistan, approximately 11 to 20 percent suffer from PTSD. Some studies suggest that number is as high as 30 percent. A wealth of research points to PTSD, specifically the depression resulting from trauma, as one of the primary contributors of binge drinking among veterans and active-duty personnel. “The percentage of depressed veterans who at some point have been involved in an episode of binge drinking has increased substantially between 2014 and 2016,” the authors wrote, with over 25 percent of “American veterans who self-identified as depressed” linked to binge drinking. These veterans suffering from depression “are more than twice as likely to be linked with drunk driving” than those without mental health concerns, the study found. Unfortunately, the cyclical impact of such an abusive, self-medicating coping mechanism is “more likely to exacerbate the conditions of PTSD rather than” remedy them, the study claims. A recent Department of Defense Health Related Behaviors Survey revealed about one-third of active-duty personnel met characteristics of hazardous drinking and alcohol use disorder, with 30 percent of military respondents reporting at least one episode of binge drinking in the month leading up to the survey. For Marines, that number was an astonishing 42.6 percent. Such actions should be sharply addressed by placing greater emphasis on command disapproval of alcohol abuse, the Rand report claimed. Researchers also recommended scaling back on-base alcohol and sales policies. Despite the recommendation, however, a dozen military commissaries across the country in July became the first to start selling beer and wine. Up to that point, alcohol had only been sold only at exchanges.